The additional capacity of Cargill's cocoa and chocolate business in Mouscron, Belgium, will meet growing demand from European customers for chocolate in confectionary, bakery, dairy and artisanal applications. 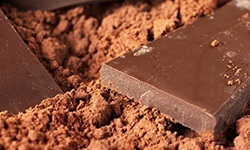 Mouscron, Belgium – 16 December 2013 – Cargill’s cocoa and chocolate business broke ground today on a U.S. $48 million (€35 million) investment to double the capacity of its Belgian chocolate production facility in Mouscron over the next two years. The additional capacity will meet growing demand for chocolate in confectionary, bakery, dairy and artisanal applications from European customers. Cargill’s cocoa and chocolate business provides its customers with a large variety of Belgian chocolates, including custom made recipes and chocolate of sustainable origin. The investment will increase capacity of both liquid dark or milk chocolate and solid chocolate drops and chunks. The new facility will source raw materials like cocoa butter from Cargill’s integrated cocoa processing plants in The Netherlands and in France. The new production lines will be operational in summer 2014 and will lead to the creation of approximately new 40 jobs over the next two years. Cargill’s cocoa and chocolate facilities in Belgium are part of its wider cocoa and chocolate network in Western Europe, Africa, Brazil, Canada and the United States. Cargill has been supplying quality cocoa and chocolate products to customers around the world in the chocolate, confectionery and food industry for over 50 years. Cargill was established in Belgium via a grain importing office in Antwerp in 1953. We now have over 1000 employees in nine locations: Antwerp (two locations), Izegem, Gent, Herent, Vilvoorde, Mechelen, Mouscron and Villers-le-Bouillet. The company has a number of different and diverse operations in the country, including the production of food ingredients and the processing, distribution and trading of a variety of agricultural products. Cargill’s European Headquarters for its food businesses and Cargill's R&D Centre Europe, Cargill’s primary technical centre serving Europe, the Middle East and Africa are also located in Belgium.